While fascisms gained ground in the 1930s, dragging Europe to the total conflagration, thousands of people realized the danger that supposed not to face and stop their feet. More than 35,000 volunteers from over 50 different countries head to Spain to aid the young Republic besieged by fascism and abandoned by Western democracies. Between September and October of 1936 the International Brigades were organized as military units formed by anti-fascist volunteers to fight against the rebel troops of General Franco. On September 21, 1938, president Juan Negrín announced their evacuation during a meeting at the League of Nations, pretending that Franco would do the same with his Italian and German allies. Approximately 10,000 volunteers lost their lives during the conflict, and their sacrifice and their struggle left an unforgettable imprint. The farewell to the International Brigades was a moving and multitudinous event that took the streets of Barcelona on October 28, 1938. This seminar aims to discuss and transmit the role of the volunteers during the Spanish Civil War, focusing on how those men and women are remembered nowadays around the world. It will highlight the participation of women in the Brigades and deal with the role of the volunteers in the French resistance and in the fight against Nazism in Europe once the conflict in Spain ended, including the role played by some brigades in post-war governments in Eastern European countries. 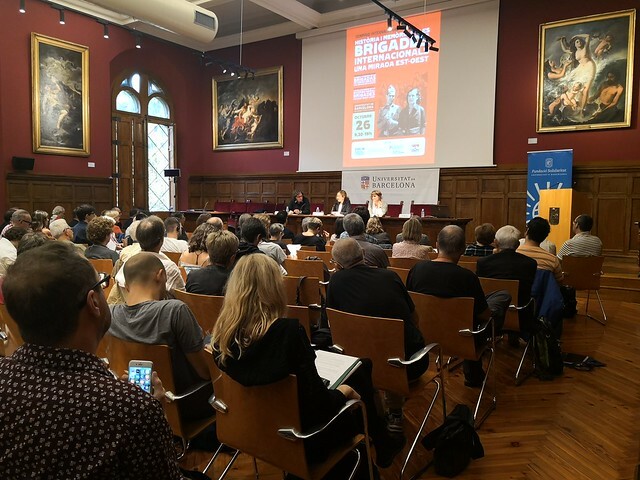 Organized by the EUROM in collaboration with the Library of the Pavilion of the Republic of the University of Barcelona, the project Sidbrint (Digital Information System on the International Brigades), and the Consortium for International Studies Abroad (CASA), the seminar is part of the Week of the International Brigades coordinated by the Amical of the International Brigades in Catalonia and counts with the support of the City Council of Barcelona. Attendance is free, but previous registration is required. During the seminar, the Library of the Pavilion of the Republic will display some selected material of the International Brigades’ collection, including posters, pictures and documents. 4,00 pm – 5,30 pm Roundtable: History and memory of the International Brigades (II).